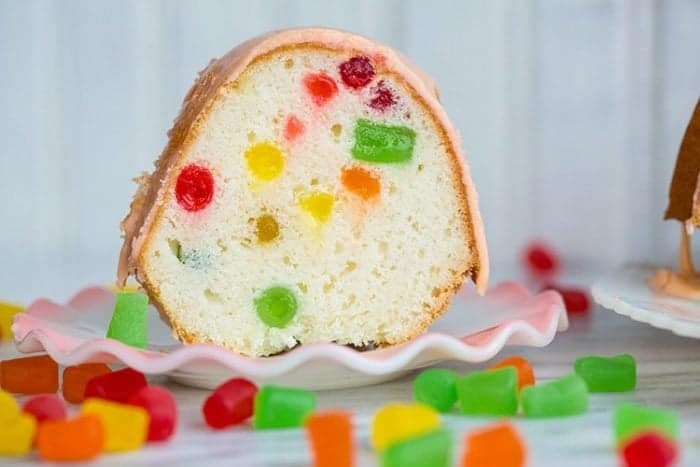 Hey, if we all can’t be rich – but I’d sure like to give that “money can’t buy happiness” the good ol’ college try – then darn it, we can have gumdrop cake. Right? I mean, how can this not be the gosh darn happiest cake ever? 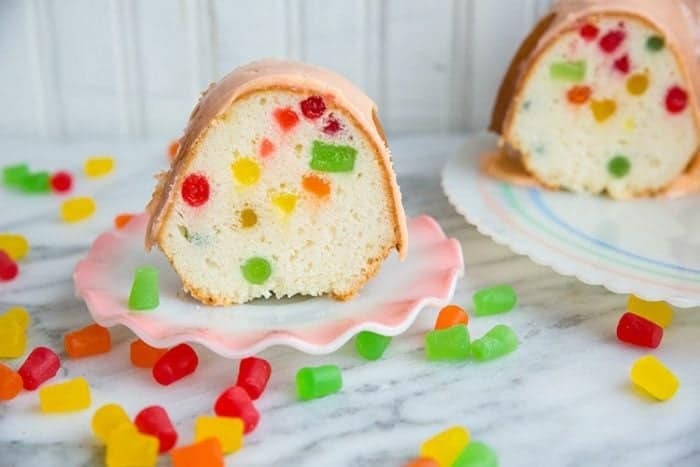 Gumdrop cake radiates happiness. It appeals the kid in us, it reminds us of the holiday season and it’s seriously delicious. 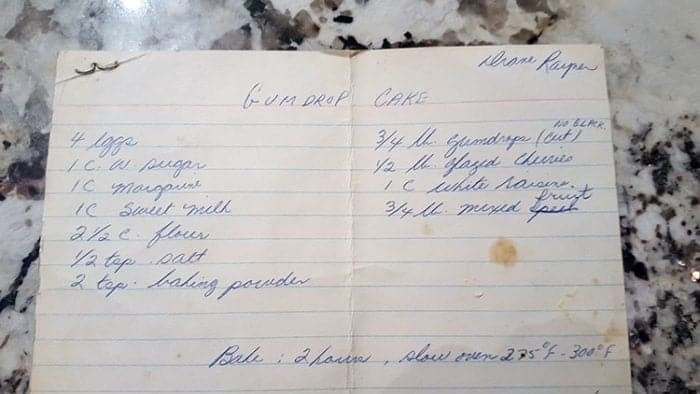 My sister and I dug up our family recipe for Gumdrop Cake, which apparently came from my mom’s friend Diane. 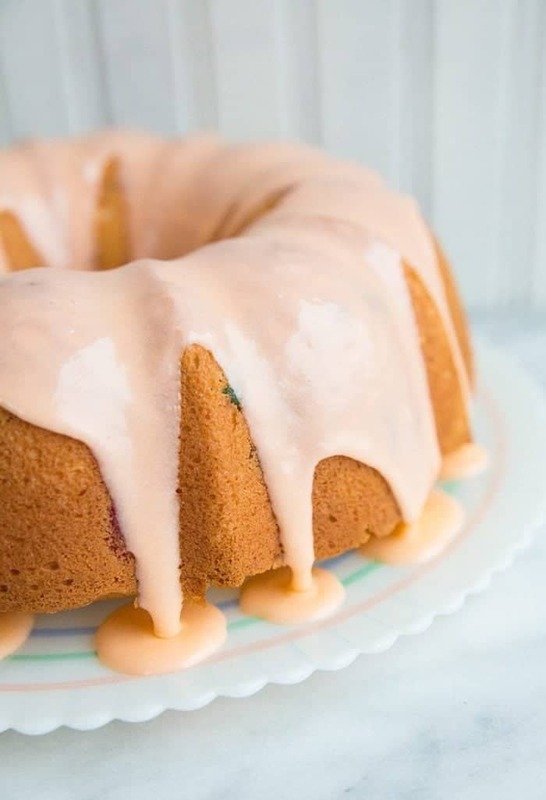 As you can see, this gumdrop cake is more of a Christmas fruit cake, but we use the base recipe since it’s so delicious and simply add 2 cups of baking gum drops instead of all of the other fruit. Who thinks that I should give this a whirl as is? Let me know in the comments below. 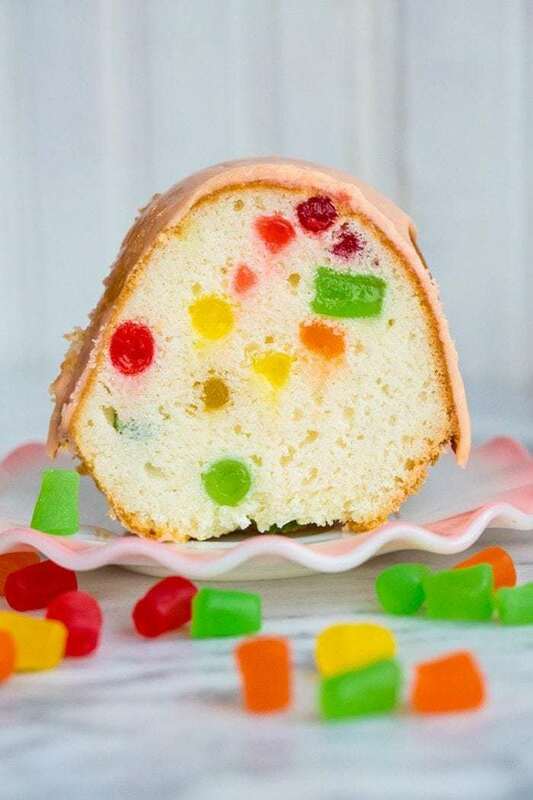 While this turns out amazing as a simple gum drop cake, the fruitcake lover in me looked at this and thought hmmmm.. that might just be the ticket for a really good fruitcake. Who else likes a solid fruitcake at Christmas? I swear that Mr Magpie and I were meant to be together as we both love fruitcake. You’ll see it in our cupboards come the holiday season, more than once. We’re fruitcake soul mates. Or, we’re fruitcakes. Make of that what you will. 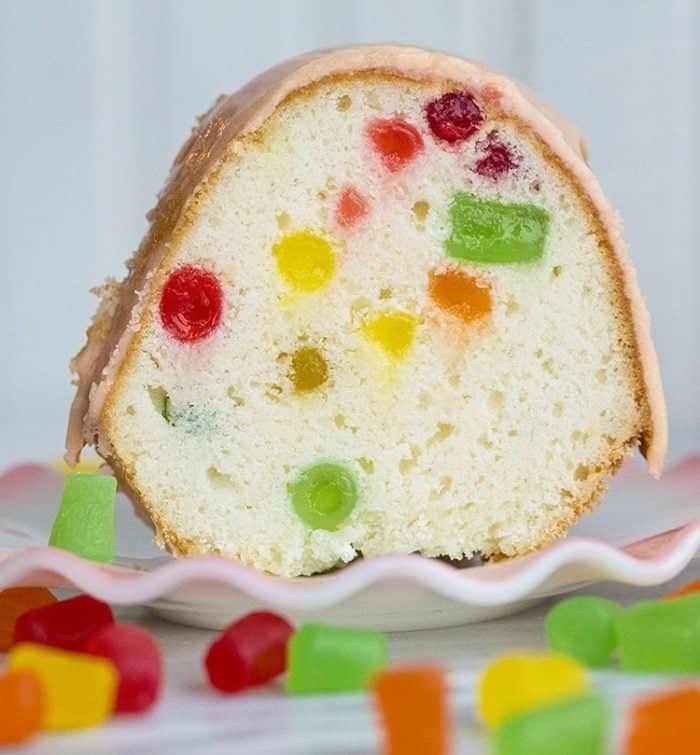 Gumdrop cake is a pound cake, denser in texture because it has the important job of holding up those gum drops. However our family recipe ends up being quite a light cake and I’m not sure if that’s because I omit the oh, 3 pounds of fruit called for? That might have been a little sarcastic but it’s actually probably why this turns out lighter than your usual gumdrop cake. The other beauty to this cake is that you can ice it to match any occasion. I really struggled with what colour I wanted to make this gum drop cake’s icing. I stumbled upon a tube of orange icing colouring and thought yes, a pale orange would be nice for a change. You can make the gumdrop cake red or green if you are feeling festive and want to get into the holiday spirit of things. I just wanted a pale orange. Such an unloved colour, orange, relegated to mainly Halloween and for no good reason. Orange is awesome. Have you seen my bonus room? Oh right, not yet. Well my dears, there’s a post coming about the huge room reno that took place this past week or so, and orange features heavily in the design. Stay tuned for that post! Let’s talk about the gum drops that you are going to use. You can use normal gum drops – minus the black – and cut them up small. I don’t guarantee that these are available in the States, but if you can find a baking gum drop that tastes like a real gum drop, you have it made in the shade, dudes. 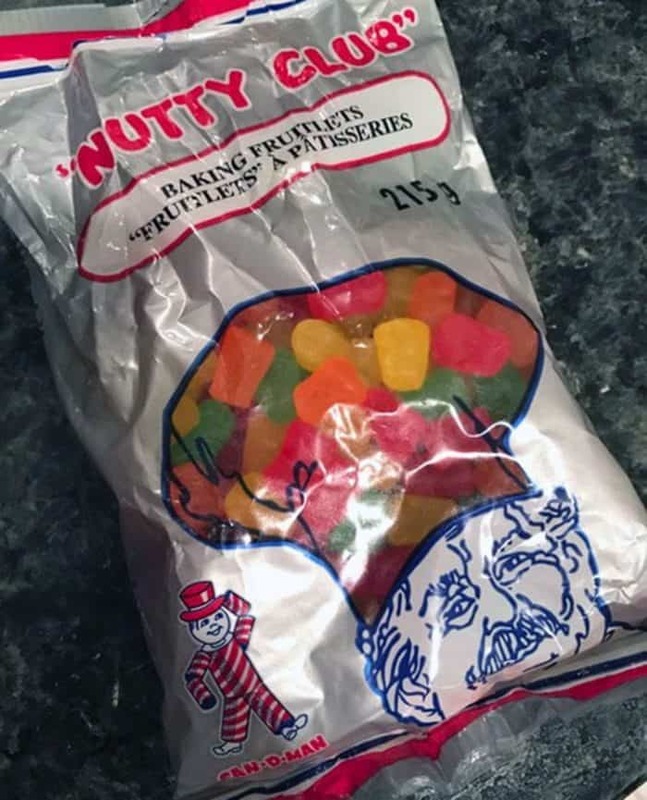 The key is to find one that tastes exactly like a real gum drops and these Nutty Club Gum Drops taste like their larger counterparts. If you find a baking gum drop that tastes gross…well, you can guess what your gum drop cake is going to taste like as well! You are better off buying gum drops ( jujube’s) and cutting them into smaller pieces if your baking ones don’t taste awesome. You can see how those baking fruitlets really disperse wonderfully throughout the cake, which is really hard to do! You mix them in ahead of time, and I don’t even bother tossing mine with flour either. If you can find them, they are the key! If you can’t, then make sure that you cut your gum drops small. So, when is the last time that you ate an awesome gum drop cake? I know that several of you shared your photos with me on Facebook of your own cakes, I’d love to see some more! 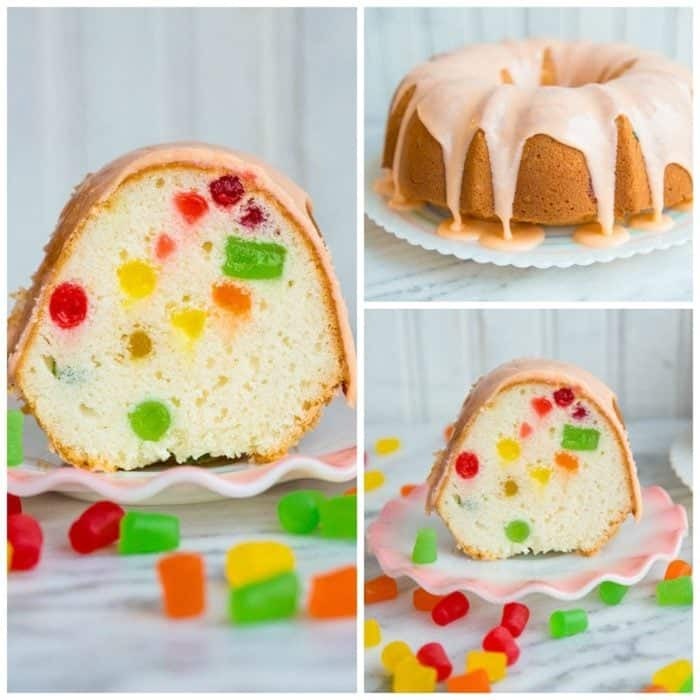 Decadent and delicious Gumdrop Cake! Perfect for your next party or holiday gathering! Beat the butter in a large mixing bowl until smooth. Add in the white sugar and beat in completely. Add in the eggs, beat until smooth again, then mix in the extracts completely. Add one third of the dry ingredients into the butter mixture, combine completely. Add in one third of the milk, beat in completely. Repeat steps until flour and milk are used up, ending on milk. Stir in the gum drops. Spray a 9 or 10 inch bundt pan with cooking spray. Spoon batter into the pan, spreading out evenly. Bake in the oven for 50-60 minutes until a cake tester inserted comes out clean. Whisk together icing ingredients until smooth and the pour over the cake. This is a question–could it be baked as a regular cake? I’m not a baker myself, but wondering how/if to do it as a 6″ cake. 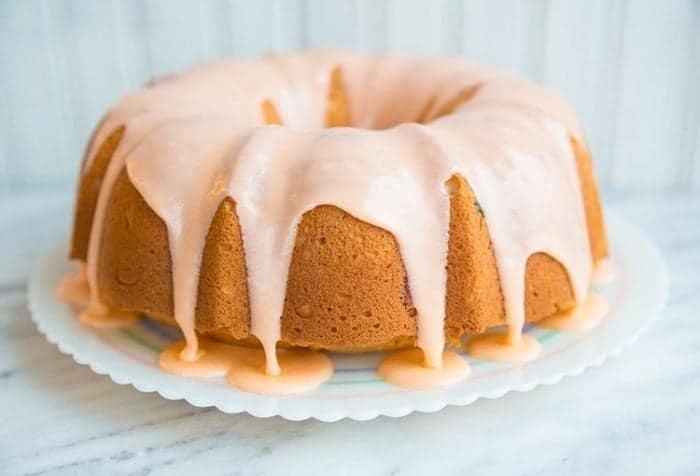 Where is the cherry in the cherry glaze icing? Do I cool this in the pan or out of pan? My grandfather owned a bakery in the 1950’s and did all the baking along with my grandmother. I can remember their gumdrop cake, which was always made for Christmas. They made it ahead of the holiday so it had time to become moist. They always added applesauce to the cake mixture, to keep it that way. Regular gumdrops were used and were cut into pieces with large, wet sheers. I made this and it taste very yummy. It’s just one of those classics! Looks like a party on a plate!! I think that’s why it’s also so popular for birthdays! Yes, those dishes too! My favourite old pattern!